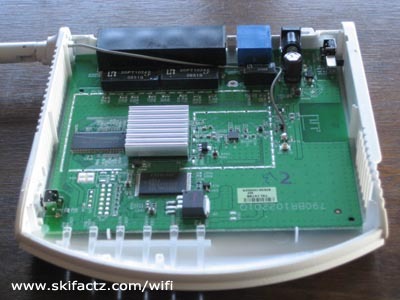 Opening the router may void your warranty. 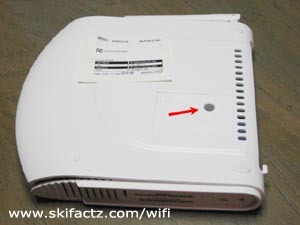 Unlike Linksys WRT54G the WHR-G125 has no seals to break in order to open the enclosure. 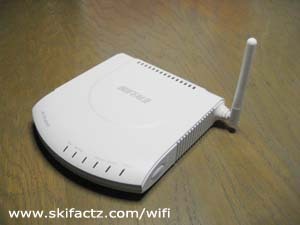 I don’t understand how Buffalo would even know that the router was taken apart if that ever came up during a warranty claim. You will need two precision scredrivers to pry the sides and one T9 size hex star screwdriver (torx) to remove a single screw. Turn the router upside down. You may want to place it on a pillow so to avoid scuffing the pristine white finish. As for me, I don’t give a damn if it gets scratched [Fig. 2]. There is a screw hidden underneath the label. You can either feel the indentation with your finger and punch through the label with a screwdriver or you can remove the label first. I took mine off with an exacto blade and placed it on a slick sticker backing so I could reaply it later. Buffalo has used a star hex shaped screw for no good reason. They obviously wanted to make it more difficult to open the enclosure. I didn’t have the right size screwdriver so I had to go get one. T9 is perfect although T7 and T8 will work too. 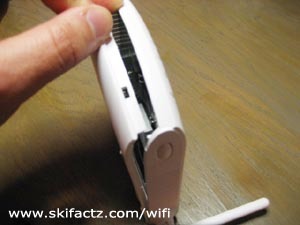 Use precision screwdrivers or other flat objects to pry off the bottom of the router. Start on one side by inserting the smaller screwdriver into the front slot and the larger into the side slot [Fig. 3]. Twist the larger screwdriver and the side tab will pop. Then turn the router around and do the same on the other side. Be careful when handling the enclosure si that it doesn’t spring back into locked position. When both sides are released insert the larger screwdriver into the front slot and pop off the center section. It will come off easy [Fig. 4]. You may damage the plastic ever so slightly. You’ve been warned.